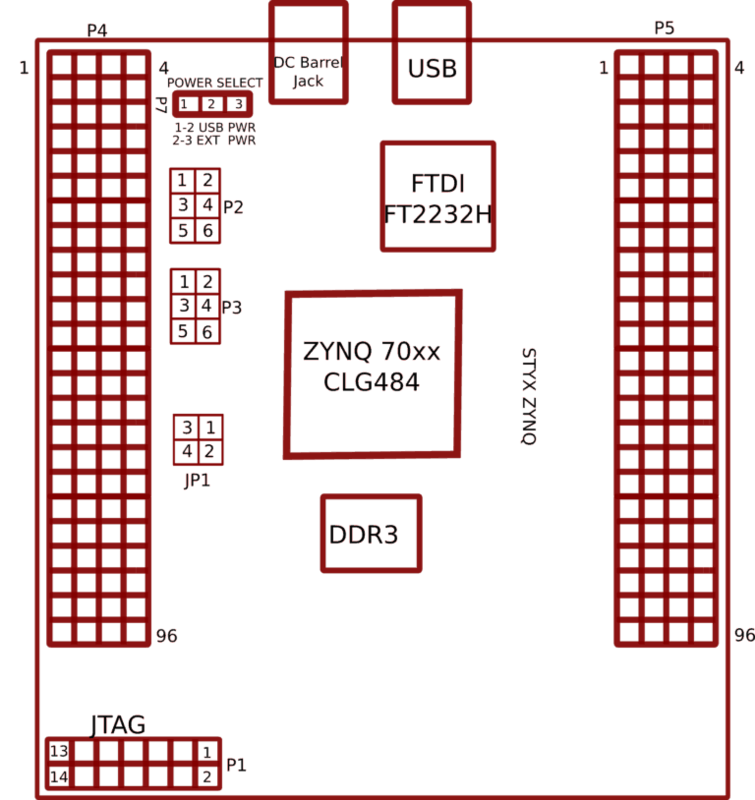 Styx is an easy to use Zynq Development Module featuring Zynq ZC7020 SoC from Xilinx with FTDI’s FT2232H Dual Channel USB Device. Zynq series of integrated circuits from Xilinx feature a hard System on Chip (SoC) with ARM core and numerous peripherals including UART, SPI, I2C, Dual Gigabit Ethernet, SDIO etc. 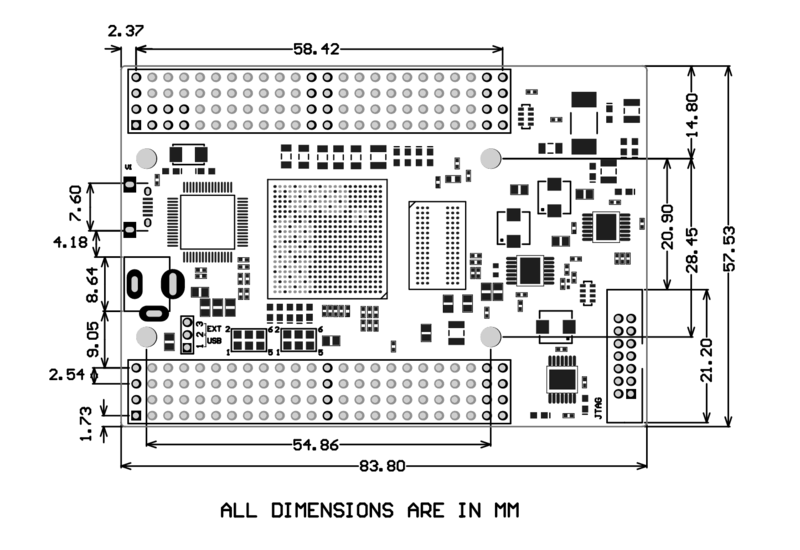 Apart from the complete SoC, the Zynq also features an FPGA die equivalent to Xilinx Series-7 devices. 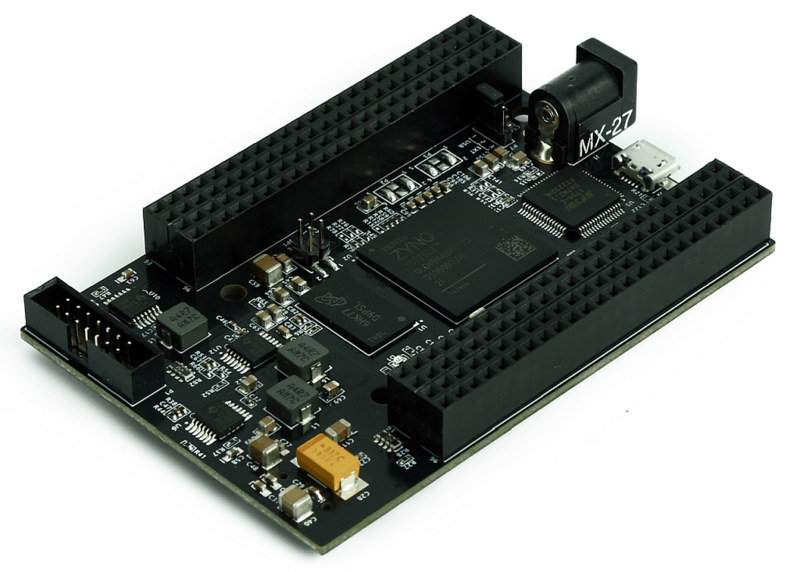 It is specifically designed for development and integration of FPGA based accelerated features in to other larger designs. Styx is pin compatible with Saturn Spartan 6 FPGA Module, Neso Artix 7 FPGA Module as well as Skoll Kintex 7 FPGA Module and thus offers seamless upgrade path. The high speed USB 2.0 interface provides fast and easy configuration download to the on-board SPI flash. No programmer or special down loader cable is needed to download the bit stream to the board. The second FTDI channel can be used to develop custom high data-rate USB based applications. Styx provides users flexibility in adding their own peripherals through IO Expansion Headers. This diagram should be used as a reference only. For detailed information, see Styx schematics at the end of this document. Details of individual connectors are as below. communicate with this module.Use a USB A to Micro B cable to connect with a PC. USB hubs (the picture on the right shows USB Micro connector). The Power Select header P7 is used to configure the power source for the board. Connect pins 1 and 2 to use USB power and connect pins 2 and 3 to use the external DC power. Channel B of FT2232H can be either connected to the SPI bus or JTAG by using on-board jumpers. By connecting SPI bus to FT2232H channel B, the SPI flash can be directly programmed to save the configuration permanently. This is the default configuration set when Styx is shipped. When FT2232H channel B is connected to SPI, Styx Configuration Downloader utility can be used to program the board. When FT2232H channel B is connected to FPGA JTAG, the JTAG signals can be accessed directly through FT2232H. 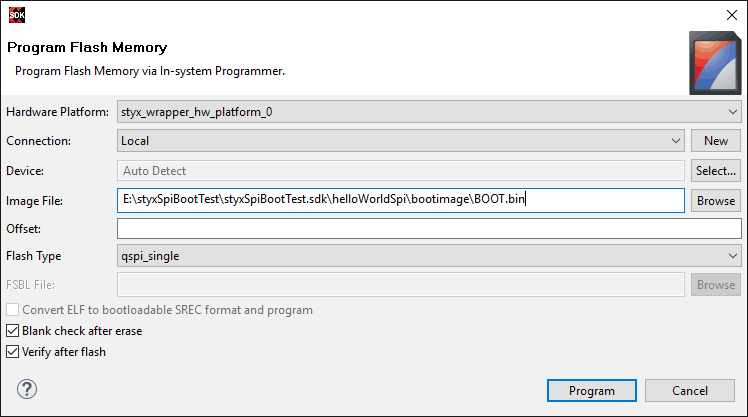 Styx Configuration Downloader utility currently does not support programming FPGA SRAM through JTAG. Please see the tables below for information about selecting SPI or JTAG for FT2232H channel B. SPI must be selected for Styx Configuration Downloader utility to work. This product requires Numato Lab drivers to be installed for proper functioning when used with Windows. 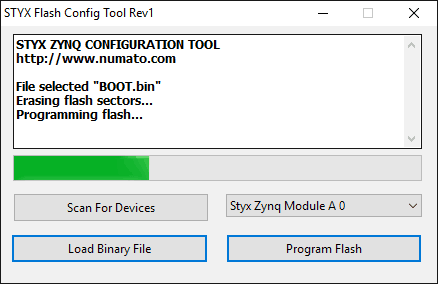 The driver can be downloaded from http://productdata.numato.com/assets/downloads/driver/Driver.zip Windows users should download and run the WHQL Certified executable file that will prompt to install the Numato Lab drivers. 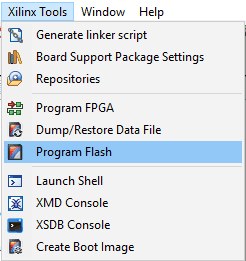 When driver installation is complete, the module should appear in Styx Flash Config Tool as Styx Zynq FPGA Module. Workflow for Zynq series is slightly different than Series-7 FPGAs. There is a tutorial on quickly getting up and running with Styx to accelerate the pace of development. Styx is factory configured to be powered directly from USB port so make sure that you are using a USB port that can power the board properly. It is recommended to connect the board directly to the PC instead of using a hub. It is practically very difficult to estimate the power consumption of the board, as it depends heavily on your design and the clock used. XILINX provides tools to estimate the power consumption. In any case if power from USB is not enough for your application, external supply can be applied to the board. 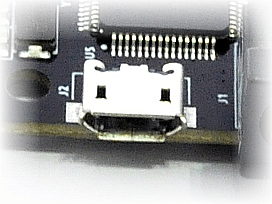 Jumper P7 should be set up properly (short pin 1-2) to use the board on external power. Styx requires five different voltages, a 3.3V, a 1.8V, a 1.0V, a 0.75V supplies and a 1.5V supply. On-board regulators derive these voltages from the USB/Ext power supply. 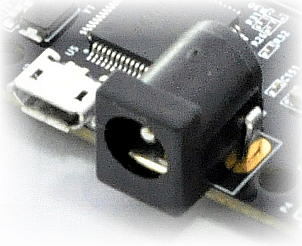 SPI Flash on-board Styx can be programmed easily using Xilinx Platform Cable USB II. Step 2: Click “Browse” and choose the “.bin” file which needs to be programmed to flash. Finally, click “Program”. SDK will start programming the on-board SPI flash and will notify if the operation went successful. Styx has an on-board FTDI FT2232 device which facilitates easy reprogramming of on-board SPI flash through USB interface. The FTDI receives bit stream from the host application and programs it in to the SPI Flash and lets the Zynq boot from the SPI flash. 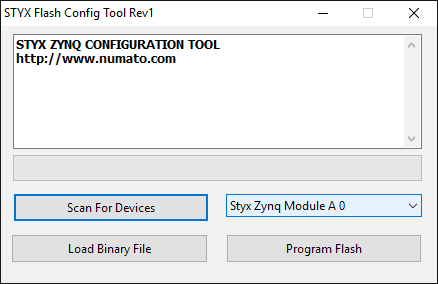 The Styx configuration application can be downloaded from www.numato.com for free. Step 1: Open Styx Configuration Tool. Click “Scan for Devices” if “Styx Zynq Module” is not detected automatically. Step 2: Click on “Load Binary File”. Select the “.bin” file and then click on “Program Flash” button. Wait till “Programming Completed” appears on the screen.